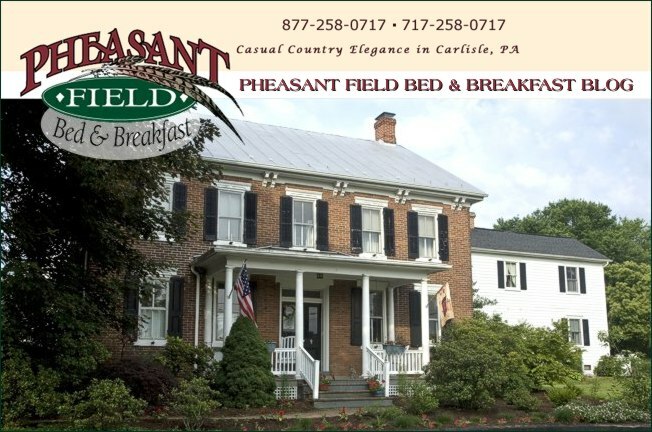 Today's breakfast recipe is found on page 14 of our cookbook, "Pheasant Field Favorites". The Oatmeal Nut Waffles are made with whole wheat flour AND oatmeal, so they are pretty healthy! I'm using pecans for the chopped nuts this morning but I hold those and ask each guest if they would like nuts so if anyone has a nut allergy or just does not like a nutty texture, they can have their waffles plain. I will use some apple slices on top of the waffles to add some color and contrast to the dish. You can order a cookbook just sending us an email - cost is $12.50 + $2.50 shipping OR stop by the B&B or visit The Kitchen Shoppe. It's hard to believe that January is almost gone! If you have not yet made reservations for Valentine's Day, it's time to do that! Another way to surprise her/him is with a Gift Certificate for a stay at some future time.